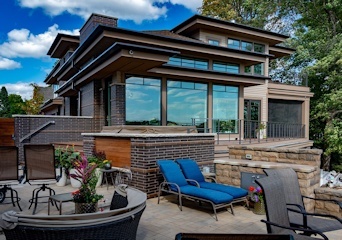 When the Minneapolis Star Tribune put together a feature profile for the Homes by Architects tour (Sept. 15-16), they chose to profile a home designed by SKD Architects’ own Steve Kleineman. Thanks to all who helped make this gorgeous home possible! Read the article here. 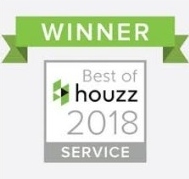 SKD Architects is honored to have won the “Best of Houzz 2018” award in the category of Customer Service, which recognizes the highest levels of client satisfaction. Thanks to everyone who helped us win this award. We are so excited and grateful for your enthusiastic response. 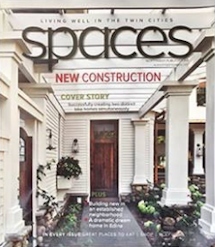 The August/September issue of Spaces magazine features a 12-page spread on SKD Architect’s residential design work. This cover story shows SKD’s versatility when they created 2 distinctly different homes, built at the same time for the same client. The magazine isn’t available online, but you can read the article here. SKD Architects was voted by the Houzz community as a double winner in their Best of Houzz 2017 awards! Our work won in the Design category since our portfolio included some of the most popular images on Houzz in 2016. We’re even more humbled to win in the category of Customer Service, which recognizes the highest levels of client satisfaction. We made the home page on Houzz.com! We’re very proud to see Houzz.com featuring a story about a home designed by SKD Architects on its home page. Congrats to Steve Kleineman and the team! Read the article here. We hit the 100,000 mark! Photos of home designs by SKD Architects have been saved to ideabooks within the Houzz community 100,000 times or more. Find your SKD inspirations on Houzz. A recent home tour inspired us to assemble a new About Us brochure. Read the brochure. A hand-crafted vanity from SKD Architects was featured in an editorial ideabook on the homepage of Houzz.com. Read the article here. For the third year in a row, SKD Architects earned a “Best of Houzz” in customer satisfaction and picked up two new awards. The Influencer badge is given to pros whose advice and knowledge is most appreciated by the Houzz community, while the Recommended badge goes only to the top-rated pros on Houzz.com. SKD Architects was proud to have a home featured in the 2014 Homes by Architects Tour. Click here to read more. 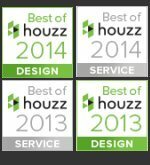 SKD Architects again wins two Best of Houzz awards! Houzz.com is the leading online platform for home remodeling, information, advice and support for homeowners and home improvement professionals. For the second year in a row, SKD Architects earned “Best of Houzz” in both categories of design and customer satisfaction. 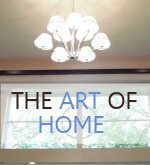 Steve Kleineman from SKD Architects is interviewed on The Art of Home on My29/WFTC. This show airs locally in the Twin Cities every Saturday morning at 11 am. The home being profiled in this episode is Parade House #6 in the Fall Parade of Homes showcase. Steve provided both the Architecture and Interior Design for this lovely Edina residence. To watch the episode, click here. Jon Snow is taking over this home's tv tonight! Are you tuning in for the final season of Game of Thrones?! A true basketball player is never too far from a ball! Looking forward to all the Final Four games this weekend. Who do you think will win it all? It is officially Spring! Fingers crossed that our lawns start to look like this one in the next few weeks. Back at ya...to the best architect ever!! To you too and your beautiful family.